This is a project about physical and museum. 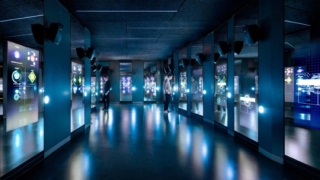 I developed the final exhibit in this highly-interactive new museum about espionage. After visitors complete several games and challenges in the museum, the Debrief exhibit shows them their vital statistics and what kind of spy they would be. The exhibit used a full-screen web browser so the application was written in React. After fetching the visitor's statistics from an API, 4K videos were composited with rendered HTML content to create a cinematic, custom experience.